Looking at the gold of Mercury retrograde, I love the aspect of addressing unfinished business. For me that translates into dozens of “To Do” lists. I have so many that some have fallen of the edge of my table, are still filed under last April or May or are completely missing in action. I love having the lists for the euphoria of being able to cross something off. However, if at the end of the day the 10 things I wanted to complete are still on the list, I feel a little defeated. This Mercury retrograde seems to be anticipating me! Since the shadow of this Mercury retrograde started up, I have consciously said NO to several new things; resisted going to the sales at the fabric stores, and at least consolidated my projects list. I have found myself not haphazardly putting stuff away from my crafting world but organizing each item’s placement in my world. I emptied the bottom drawer of my 1990’s wide drawer filing cabinet and filled it with the numerous small sewing projects (Tea cozies, wall hangings, bags etc) and went the distance to take a picture of each one to create an actual file and list of projects – the ultimate to do list. The net result is that i can now see my office floor and while my shelves are not yet sporting a minimalist look…they look organized! It is enough of a shift that i actually feel a huge space opening of inner freedom and a stream of motivation to tackle the remaining lists! 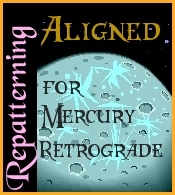 Mercury retrograde begins on Wednesday July 25th and Julie and I will be doing the alignment session that day. I am looking forward to the expansive energy the session will bring to everyone in the group and how my to do lists will be helped! How are you anticipating and using the positive energy of Mercury Retrograde? This entry was posted in General Comments and tagged astrology, Carolyn Winter, Julie Simmons, Mercury Retrograde, organization, resonance repatterning, time managment, to do lists. Bookmark the permalink.